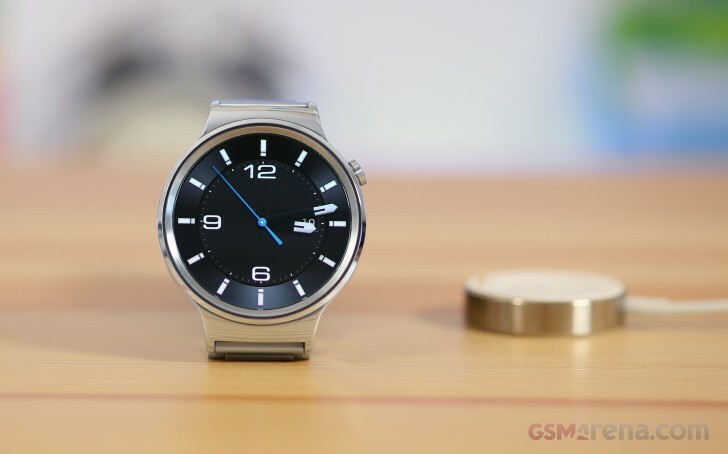 The Huawei Watch has a 1.4-inch AMOLED display with 400x400 pixel resolution. A density of 286ppi means it's not quite as sharp as the 302ppi smaller 1.2-inch 360x360 pixel display of the Samsung Gear S2, but is sharper than either size of the Moto 360. That's the numbers. The reality is that at anything closer than 25cm you'd be seeing the diamond pentile subpixel arrangement. Indeed, that holds true almost exclusively for white backgrounds, and having an AMOLED smartwatch is all about them blacks. The thing is that Android Wear displays its menus and notifications in white and there's no going around that, no matter what watch face you select. You could argue that 20cm is much too close a distance to be looking at a watch face, but when it's a smartwatch, you will need to read some seriously tiny text and you'd be sticking your nose into that thing quite often. All that said, the good thing is that the perceivable effect of this issue wears off quickly after you switch from inspecting to actually using the Watch. What's harder to live with, again for light backgrounds, is how the glass bevel around the edge magnifies the subpixels making them easily visible. The effect is present when viewing head-on, as well as at an angle - pretty much all the time. To reiterate - dark watch faces don't suffer from this at all, it's white ones and the menus. Another gripe we have with the Huawei Watch is that it doesn't have an ambient light sensor, and consecutively an auto brightness mode. The way we see it, it's an essential feature for a smartwatch and the sole reason not to include one was probably not to spoil the classic design. Both Apple and Samsung (on the Gear S2) went with a behind-the-display solution, so it can be done. 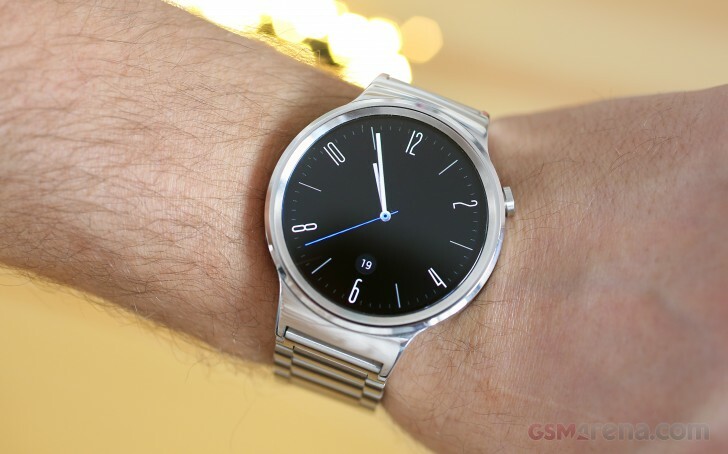 The Huawei Watch draws power from a 300mAh battery, which is obviously not readily replaceable. Capacity is the same as the similarly sized 42mm Moto 360 (2nd gen), but smaller than the 410mAh of the LG G Watch R with its 1.3-inch display. The Samsung Gear S2 is both smaller in diameter, has a different chipset and runs another OS, while packing a 250mAh cell. Of course all this number crunching makes little sense in the real world. Devising a truly objective standardized battery test for smartwatches is impossible for now, so a reviewer is only left to detail their usage and observations. So the list goes like this. A nearly incessant stream of Viber notifications as part of a 7-member group where someone always has something to say, plus a significant other who does too, as well as half a dozen emails, and 2-3 voice calls was the smartwatch's daily diet for the period of this review. The Watch was paired to a phone via Bluetooth only - Wi-Fi was switched off. Brightness was set to 3 out of 5 and the Always On mode was enabled. Watch faces were frequently changed, but since most of the time the Watch is in the Always On state, as opposed to full-on color watch face, that doesn't seem to make all that much of a difference. The Fit and Daily tracking apps were constantly doing their thing, tracking steps and active times and whatnot. A couple of alarms each morning would often vibrate for several minutes too. The heart-rate sensor wasn't extensively used (2-3 times a day), nor were actual workouts monitored. Under this pattern of use, the Huawei Watch lasted through an entire day, and still had double digits of juice when the alarm went off around 8 on the next morning. Now, you'd argue that overnight charging is the way to go, but having the vibrating alarm wake you up in the morning without disturbing the significant other is a top feature to use. And also, if you spend some time around the house in the mornings instead of shooting straight out for work, the Watch will have enough time to get back to full charge and be ready for another round of the same. Of course, you might establish your own entirely different pattern, the point is that the Watch can last a busy 24-hour day. And it's not like that's exactly praiseworthy - that's just the way smartwatches still are.